iOS power-users, the Android-envy can stop now: Third-party keyboards have arrived. While the majority of iOS users likely find the default iOS keyboard works just fine, other alternative keyboards have cropped up that offer some capabilities that many may find useful. With the release of iOS 8, Apple has finally loosened the reins a bit and, among other features, now allows you to download alternate keyboards from the App Store. Installing and selecting one of these keyboards makes it appear in all your apps. After downloading a keyboard app from the App Store, you enable it by opening the Settings app, then going to General > Keyboards. Once you've added at least one alternate keyboard, a new key with a globe symbol appears on the bottom row of the keyboard. (If you had the Emoji keyboard enabled in earlier versions of iOS, this should look familiar already.) Tapping on the globe key selects the next keyboard in the list. Not sure where to start in picking a keyboard? Here’s a quick preview of some of the most popular keyboards that have been downloaded and installed on iOS 8 since its recent release, most of which are optimized for both the iPhone and iPad. Apple's own offering now has QuickType, placing it in the ring with other third-party smart keyboards. Before you go running off to replace Apple's built-in keyboard, it's worth taking a look at the changes iOS 8 has introduced. While the built-in keyboard doesn't look radically different from previous versions, Apple has introduced several useful improvements. The biggest of these enhancements is called QuickType, which watches both what you type and in what context (taking a look at how you type in the Mail and Messages apps, for example) and offers word predictions, which it displays along the top row. The more you use it, the more it learns your typing habits in those various contexts and fine tunes the suggestions. The changes aren't all under the hood, either. When used in landscape mode on the iPhone or iPod touch, for example, the keyboard now offers some new useful editing keys, like left/right arrows for moving the cursor (finally! ), an undo key, and a key for quick access to Emoji characters. But if these incremental improvements aren't enough to keep you in the Apple fold, there are several alternative keyboards you can explore. Swype specializes in slide-to-type gestures. Due to its popularity in the Android world, Nuance's Swype ($1) is probably the most recognized name in alternative keyboards. This app is aptly named because, rather than tapping on the keys, you swipe across the keyboard, forming gestures that Swype uses to recognize complete words. (You can still tap out individual letters whenever you prefer.) In case your swipes are a little off kilter, the app provides built-in auto-correction of both words and phrases. By observing your keyboard usage, Swype can predict words you're likely to use next. If you find yourself using a set of commonly used words or phrases, you can assign each a custom gesture so that you can type them quickly with a simple, smaller gesture. I didn't think I would care for a swipe-style keyboard, but I've become a fan of Swype on my iPhone 6, although not as much on the iPad's larger keyboard. In the short time I've used it, my typing speed and accuracy are much better than I had expected. SwiftKey remembers how you use language and can sync your library across devices—if you let it. SwiftKey (free) is another popular alternative keyboard from the Android world, and already has quite a bit of buzz within the iOS community, thanks to its Note app that launched earlier in 2014. It supports the "swipe-to-type" system—called SwiftKey Flow—and, also like Swype, you can either swipe or tap on the keys as you prefer. 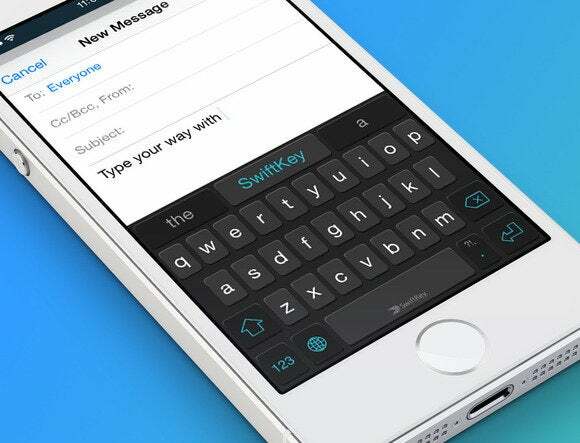 SwiftKey watches what you type and attempts to learn your habits so that it can make corrections and predictions. By itself, this isn't a unique feature, but SwiftKey takes it a few steps further: If you connect to the app via Google or Facebook, it can read your past correspondences to learn more about you and your language, and then store all that data through an option called SwiftKey Cloud. Fleksy looks at your typing pattern and predicts what you're trying to say. Yet another keyboard that started out on Android, Syntellia's Fleksy ($1) had previously been available on iOS as a standalone text-processing app, in which you'd compose your text using its special keyboard, and then copy/paste into other apps. Now, with iOS 8, you can use Fleksy's keyboard system wide on your iOS device, and this may be just the keyboard that ham-fisted typists have been looking for. I've found that Fleksy usually does a good job of correcting common spelling mistakes, and I like how you can quickly swipe right to add a space or swipe left to delete a word. However, I won't break any speed records with it (or with any software keyboard, for that matter). But, it may be just what a lot of bad typists have been waiting for. Stack ditches the keyboard and converts your handwriting to text instead. MyScript's Stack (free) is the "un-keyboard" replacement for iOS because it uses handwriting recognition rather than a standard keyboard-style interface. As you write, using either your finger or a stylus, Stack interprets your handwriting in real time, letter-by-letter, while also making word predictions. Like others in this category, those suggestions appear directly above the handwriting area, where you can tap to insert the desired word into your text. I've had pretty good experience with this keyboard, but I've found that I prefer using it on my iPad, where it has a much larger writing surface than on the iPhone's smaller screen. However, size really doesn't matter in this case, because you can write each letter directly on top of each other on the smaller screen and it works just as well as if you write each letter consecutively. Minuum pushes the keyboard out of the way to make room for the text box. While many of the most popular iOS keyboard replacements have been available for Android devices for quite some time, Minuum ($4) is a relative newcomer to both platforms, and its claim to fame is its minimalist design. In its regular mode, it functions as a normal full-size keyboard. (It is currently available only for the iPhone and iPod touch; no iPad-optimized version is available.) However, you can shrink it down to just a fraction of its normal size, which allows you to see more of your screen. Unfortunately, that also means you see less of the keyboard. Because of my own minimalist sensibilities, I find Minuum very appealing, but getting used to the small key targets has been challenging in my limited use so far. I think they have a ways to go before I can achieve minimalist keyboard nirvana. TouchPal includes two keys in one—just swipe up on the key to activate the secondary character. At first glance, you might mistake the TouchPal (free) keyboard for iOS 8's built-in keyboard. But if you look closely, you'll see that many of the keycaps sport more than one character. For example, the "Q" key has a small "1" superimposed on it, while the letter "Z" and the "@" symbol share a keycap. Tapping normally on the key produces the primary letter, while sliding up on the key produces the alternate symbol. This lets you access a wide range of common letters, numbers, and punctuation characters without having to change keyboard layouts. TouchPal uses those extra keyboard layout screens to provide a huge number of emoji characters and graphic symbols. If that's not enough, TouchPal also makes an attempt at being a swipe-friendly keyboard, but that feature is not quite on par with either Swype or SwiftKey. TextExpander is not just a keyboard—it's a productivity utility that makes typing quicker. It's quite likely that Smile Software’s TextExpander 3 ($5) is going to make a large group of people very happy—namely, the existing users of the TextExpander text-expansion app on OS X and iOS. If you're not already familiar, TextExpander is a text expansion utility that lets you assign abbreviations to blocks of text and then expand those blocks by typing just their abbreviation. (See Macworld's previous reviews of TextExpander for Mac and TextExpander for iOS for a complete description of the software.) Released first for the Mac, then later for iOS, the Mac app works in almost every program, but its functionality was greatly limited in iOS 7 and earlier due to Apple's strict policies. Smile was able to circumvent these restrictions, in part, by providing a TextExpander "compatibility library" which other developers could add to their apps, allowing snippets to be expanded directly within those apps, just as they could on the Mac. But now, with iOS 8 providing greater inter-app compatibility, TextExpander 3 now functions as a third-party keyboard, which allows it to work across all apps on your device. That means I can now expand my email signature line in Mail on my iPhone exactly as I can in Mail on my Mac. That makes me very happy, indeed. While you'll get the most value from TextExpander 3 if you also use TextExpander on the Mac, you can certainly use TextExpander within iOS only if you want, creating and managing your snippets solely on your iPhone, iPod touch or iPad, and even syncing snippets among those devices. Apple is playing some catch-up here with the addition of this long-awaited feature. However, it seems like Apple rarely delays implementing a solid idea without good reason, and it's quite likely that security and privacy concerns were at the center of this decision to hold off until the company was certain it could be implemented properly. Similarly, if you have an iOS device connected to company email or other company-owned resources, you should consider contacting your company's IT department to see if they have any policies governing the use of these third-party keyboards. Privacy issues aside, even though the ability to install alternative keyboards is a welcome addition to iOS, there's still some work that Apple could do in this area. Specifically, my biggest gripe is that selecting a keyboard activates it in every app on your device. For me, I would like to have the ability to dedicate different keyboards for different apps. For example, I will always use the TextExpander keyboard in Mail and Evernote, but would prefer Swype or SwiftKey in Facebook or Twitter. Granted, Apple has made it easy to switch among keyboards, but if you use a wide variety of apps on your device, this constant switching from keyboard to keyboard can get tiring. Hopefully this is just a start and we'll see greater keyboard-related functionality in future updates, but I'm very thankful for the options we have today.